Woocoo Shire, an area of 2006 sq km with a population of about 3400 people was generally 40 km west of Maryborough. It was formed in 1914 by severance from Tiaro Shire, and parts of Antigua and Howard Shires were included in it. The Shire was pre-dated by the Woocoo parish and the naming of Mount Woocoo; the word is thought to have been derived from an Aboriginal word describing the echidna. Before the opening of the railway running east-west across the former shire, the Woocoo district consisted of large pastoral holdings. Timber, mainly hoop pine, was cut and hauled to Maryborough. Upon the opening of the line in 1889 timber cutters had vast numbers of saw-logs stacked at the Brooweena rail siding in readiness for the first journey. Farm selections followed the railway, landholders supplementing dairying with timber cutting. A primary school was opened in Brooweena in 1904, together with a school at Boompa (west of Brooweena) in the same year. Five years before, a school had opened at Aramara (east of Brooweena). The spread of settlement saw seven primary schools functioning in the shire in the mid 1930s. That period was also a heyday for the timber industry: a Brooweena saw mill (1924) contributed to keeping teams in business, hauling timber to the mill and the railway yards. Until the 1970s the shire's population numbered between 500 and 750. The expansion of the Hervey Bay hinterland saw the population of Burrum Heads, Toogum and Torbanlea (all in Woocoo Shire) grow quickly, but those areas were severed in 1982 and put in the Town (later City) of Hervey Bay. Woocoo Shire's distinct rural leaning had been expressed 18 years before when a local historical society was formed. It set up a museum in the Brooweena QCWA hall in 1971, and later gathered together several unused buildings, including the railway goods shed and station, a slab house and the original shire office, a gabled weatherboard building (1915) on stilts, scarcely bigger than a shed. Six schools remained in the shire in the postwar years, and five closed during 1958-84. Brooweena's remains, but some children are bussed to Biggenden and Maryborough, exclusively so for secondary schooling. Churches were not so numerous: a Catholic church (1949) is at Aramara and an Anglican one (1949) is at Brooweena. In 1992 fewer than 1000 milk cattle were recorded in Woocoo Shire; meat cattle numbered nearly 29,000. In addition there were 3900 ha of field crops and 2900 ha of sugar cane. 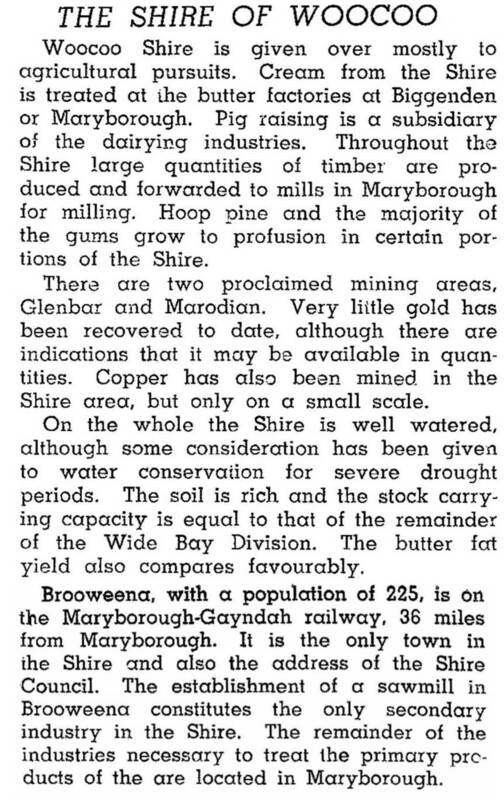 The shire had five saw mills, mainly drawing on hoop pine and hardwood plantations and a woodchip mill. On 15 March 2008 Woocoo shire was amalgamated with Hervey Bay City, Maryborough City and the northern part of Tiaro Shire to form Fraser Coast Regional Council.